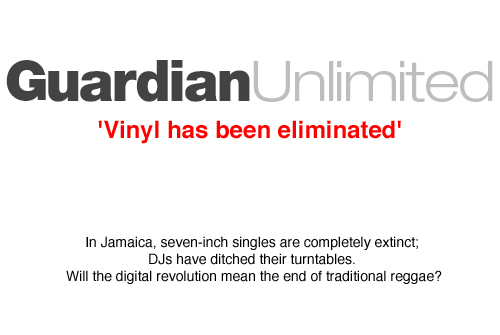 FridayÂ´s issue of the Guardian featured an article on the impact of the “elimination” of vinyl on Jamaican popular music. In Jamaica, this doesnÂ´t really affect artists as they still have the opportunity to earn money playing live shows and voicing dubplates. It really hits the producers though, who are “cut of ReggaeÂ´s economic loop”. Hi that is very sad news that Jamaica no longer seem to be doing vinyl, in alot of ways it has been kept alive from the grass roots up by reggae artists who still love their 7inch and 12inch vinyl. Having said that a new pressing plant has emerged in the United Kingdom called Phoenix Of Vinyl Ltd – http://www.phoenixofvinyl.com I have pressed a few of my catalogues with them and they are great, with commitment to pressing out superb vinyl quality and affordable prices. Long live Vinyl, long live Phoenix Of Vinyl and any other new pressing plants that emerge!